From NPR correspondent Keith O’ Brien comes this thrilling Young Readers' edition of the untold story about pioneering women, including Amelia Earhart, who fought to compete against men in the high-stakes national air races of the 1920s and 1930s—and won. In the years between World War I and World War II, airplane racing was one of the most popular sports in America. Thousands of fans flocked to multiday events, and the pilots who competed in these races were hailed as heroes. Well, the male pilots were hailed. Women who flew planes were often ridiculed by the press, and initially they weren’t invited to race. Yet a group of women were determined to take to the sky—no matter what. With guts and grit, they overcame incredible odds both on the ground and in the air to pursue their dreams of flying and racing planes. 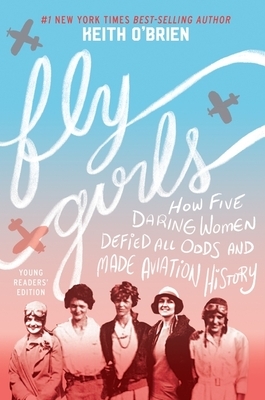 Fly Girls follows the stories of five remarkable women: Florence Klingensmith, a high‑school dropout from North Dakota; Ruth Elder, an Alabama housewife; Amelia Earhart, the most famous, but not necessarily the most skilled; Ruth Nichols, a daughter of Wall Street wealth who longed to live a life of her own; and Louise Thaden, who got her start selling coal in Wichita. Together, they fought for the chance to race against the men—and in 1936 one of them would triumph in the toughest race of all. Complete with photographs and a glossary, Fly Girls celebrates a little-known slice of history wherein tenacious, trail-blazing women braved all obstacles to achieve greatness.